Tomorrow (Friday 31st March 2017) the Aberdeen law project will hold a seminar to discuss Brexit and how it will affect smaller organisations and charities. There will be a Q & A session with lecturer Dr. Justin Borg-Barthet. If you would like to attend, email general@abdnlawproject.com with the number of people and any advance questions you wish to put to Dr Borg-Barthet. The event will run from 4pm – 5:30pm and will be held in New Kings Room 1. Shining Stars of Europe is a video competition for anyone who’d like to share their ideas for the future. All you need to do is submit a short video (no more than two minutes). Winning participants will get the opportunity through travel and project grants to put their ideas in to practice, so get your thinking/director caps on! The deadline for submissions is 18 September 2016. For all the information you need to get started go to the official website. In the meantime, you can have a look at last year’s winning entries below. Good luck! Dr Craig McAngus, a lecturer from the University’s Politics and International Development Department has written an article for ‘The Conversation’ entitled Scottish independence back in play after Brexit shock – with a note of caution. If you want to read more on this subject the Scottish Parliament Information Centre (SPICe) has produced a briefing paper entitled Following the EU Referendum – Frequently Asked Questions. The House of Commons Library has also produced impartial analysis on the next steps. In addition our colleagues at the EDC in Cardiff have produced an extremely comprehensive guide with hyperlinks to information sources on the results and subsequent analysis of the referendum from across the UK and the EU. Staff here at the EDC recently attended the EU referendum panel discussion event in the Kings Conference Centre entitled ‘The UK and Europe. In or Out?’ and found it a very good format for exploring and clarifying the issues around the referendum. In the first hour, each of the four panellists, after being introduced, gave a 15 minute speech on a particular aspect of the EU and the UK’s relationship with it. The entire second hour (and a little bit more) was devoted to questions from the audience. This event was part of The UK in a Changing Europe Initiative which provides and promotes independent research into the complex subject. It is funded by the (ESRC), and based at Kings College, London. Their website has lots of useful facts and figures as well as discussion papers and analysis. The UK in a Changing Europe Initiative is putting on events across the country and includes another one in Aberdeen. The Aberdeen business breakfast briefing on the EU will be on the 20th May. Big crowds at the EYE 2014 © European Union. Licensed for reuse under this Creative Commons Licence. 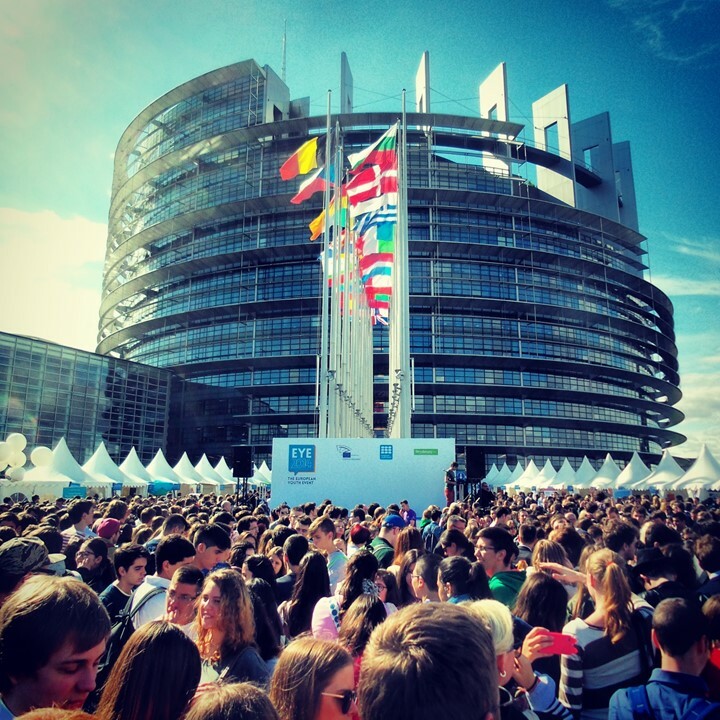 Organised by the European Parliament, the European Youth Event (EYE) is an opportunity for people between the ages of 16 and 30 to gather in Strasbourg and raise and discuss important issues with European decision makers. If you’re interested in attending EYE 2016, which will take place on 20th-21st May next year, go to the EYE website, their Facebook page or check out the Twitter feed to find out more. In the meantime, have a look at the video below to get a quick flavour of what it’s all about.